In Mexican cooking there are 3 ever-present ingredients: chiles, corn and beans. They can all be prepared into a great variety of forms, but what doesn’t change is their importance in the deep history of Mexican cuisine. In his book “Nuestro mero mole”, Jesus Flores y Escalante states that Mexico is the country where beans are used the most. He goes on to say that beans can be found in 70% of Mexican dishes, the percentage includes appetisers, snacks, side and main dishes. That is a huge number and a great reason for those interested in authentic Mexican cuisine to learn to cook beans from scratch. As if the number above did not make apparent how important beans are to Mexicans, know that in our homes there is always a pot of beans on the stove or ones in the refrigerator ready to be used. Because beans are such an integral part of our daily nourishment Mexican cooks take the process of simmering a pot of beans quite seriously. Each person has their own unique way of preparing them. Every thing from the preferred bean variety, the type of pot used to the seasonings can differ greatly from one cook to another. To prove my point I interviewed cooks in my family. Their responses were all different; some used pintos others peruvian or black beans, some used only salt as seasoning while others liked to use onion, garlic and/or fresh leaves of culantro or epazote. Additionally a few like to add a bit of oil to the pot and many preferred the traditional earthenware pot to cook their beans. You don’t have to feel overwhelmed because your beans can be prepared any way you like. I’m going to share some basics and tips to help you navigate the process. At the end you will have all the information you need and be proud of your simmering olla de frijoles (pot of beans). Walk into any market in Mexico and you’ll be happily greeted with a big choice of dried beans. (If you need to ask a vendor for the beans make sure you ask for the “frijol” of your choice, don’t use the word “frijoles” because that word is used to signify cooked beans only.) It is believed that over 50 varieties of beans are eaten in Mexico. They are all delicious and can all be prepared the same way or in a variety of recipes. 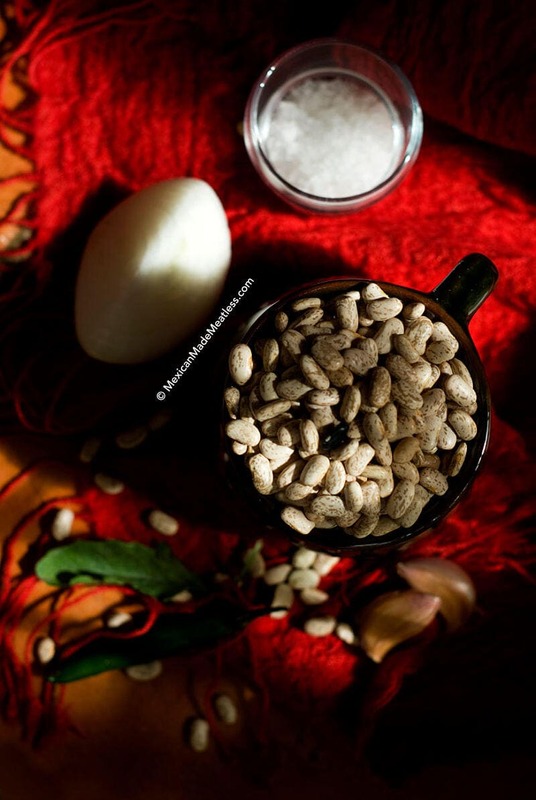 To make a basic pot of Mexican beans you can use dried pinto, peruano (also know as mayocoba) or black beans. Growing up my mom always used pintos, and that is what I like to use to, but different areas of Mexico have their preferred bean variety. What matters the most is that the beans be of good quality. When purchasing dried beans you want to avoid wrinkled, damaged beans and ones with holes. The wrinkled beans are too dry, they’ll take much longer to cook and won’t taste as good as smooth skinned beans. Damaged or ones that are chipped or split should be discarded. If your beans have holes then they’ve been infested with bean weevils, you don’t want to eat them. You might want to throw out those packages because the weevils will infest other dry goods in your cupboard. Once you’ve chosen the bean variety it’s time to pick through them. This means that we need to inspect them for rocks, debris, and wrinkled, discoloured, damaged or beans with holes. We, of course, will throw those in the garbage and only keep the whole smooth-skinned ones. Growing up I never once saw my mother or any other extended family member soak beans overnight. I personally don’t like to pre-soak beans, the only exception is if I won’t be home for the required simmering time. It really isn’t necessary to soak beans because as long as you have the time to check on the pot now and then, there isn’t much else required. The reason some cooks pre-soak beans is because it speeds up the cooking time. Some also believe that this process eliminates the enzyme that causes flatulence. (In the seasonings section I’ll tell you another way you can neutralise the enzyme.) In my research I have found both people that believe this is true and those that do not. One reason I don’t like to pre-soak beans is because I’ve read that nutrients can be lost in the process. Additionally they can easily begin fermenting and develop a sour smell and taste. If you choose to pre-soak The World’s Healthiest Foods website suggests “placing them in a bowl of cold water and keeping them in the refrigerator for eight hours or overnight…drain and rinse the beans well with clean water” before cooking. Many Mexican people use earthenware pots (called ollas de barro in Spanish) to cook their beans. These pots are where the name for beans, prepared this way, get their name: frijoles de olla or beans of the pot, the pot being an earthenware one. Those that use earthenware believe that the pots impart an indispensable and unique flavour, but not everyone owns one so it’s perfectly fine to use a regular heavy pot to cook your Mexican beans. My mother, like many other Mexican cooks, occasionally uses a pressure cooker to cook beans. She once had one explode and after seeing the results I forever swore off of pressure cookers. If you are experienced and comfortable with them, then go ahead an use it for a quick cooking method. This is another element in the frijol cooking process where opinions vary greatly. I’ll give you my opinions and different options but feel free to pick and choose from the list. Salt: If you research instructions for cooking dried beans the opinion is to skip the salt until the beans have softened. My brother-in-law salts only at the end, while my mother waits after the beans have soften and 20 minutes before the beans are done. In all honestly I sometimes add the salt at the beginning and other times after softening, I haven’t noticed a real difference in the cooking times. What I would suggest is to always use sea salt. Epazote or Other Herbs: One of my sisters likes to use culantro (not exactly the same thing as cilantro), I like to add leaves of epazote. You might have a difficult time locating this Mexican herb, but if you find it then I highly suggest using it. Epazote has a very unique smell and flavour that I find quite pleasant. It is also used by many because it prevents the unpleasant side effect (flatulence) some can experience from eating beans. I recently read that some cooks like adding baking soda to help eliminate the intestinal problems. I’ve never seen Mexican cooks do this so I can’t tell you if in fact it works. It makes me wonder if a bitter taste is left on the beans? Onions, Garlic and Chiles: The use of these three varies greatly. Some Mexican cooks use only onion, while others don’t use any until the boiled beans are ready to be made into refried beans. About half of the family members I interviewed said they like to add a clove or two of garlic. No one in my family mentioned adding chile peppers to the boiling beans, but I’ve read many recipes where people add a jalapeño or Serrano chile. One of my cousins made a good point, she said she waits to add any additional ingredients until she either mashes or makes a dish out of the boiled beans. I personally like to use all three (onion, garlic and chiles), but it is up to you. Oil: I always use olive oil to sauté the onion, garlic and chiles before adding my beans to the pot. Though this isn’t the traditional Mexican oil of choice, it is mine. Half of my family members also mentioned adding a splash of oil to the pot. One cousin said she does so to prevent the beans from becoming sour and to last longer. Though not commonly used (in fact I’ve never seen them) by Mexican cooks, acidic ingredients in a basic pot of beans call for caution. If you choose to incorporate ingredients like lime, lemon, tomatoes, vinegar, etc., they should be added only once the beans have cooked through. The reason being that acid will slow down the cooking time tremendously. Instead, if you want to add those ingredients wait until you mash them or prepare the cooked beans into bean stews. Making a pot of traditional Mexican beans is easy and cheaper than buying canned. Taste the real flavours of Mexico with this delicious recipe. Pick through the beans to remove and dirt, rocks and broken or damaged beans. Rinse throughly, then place the beans in a large pot that has a lid. Add the onion, garlic and epazote if using. Pour in plenty of water to more than cover the beans. Cover and turn the heat to high and allow to come to the boil. Once boiling, turn the heat down to medium-low and simmer for about 2 hours. You'll need to check on the beans now and then to make sure they have plenty of water, if not add more so that they don't burn. After about 2 hours or ONLY once the beans have softened and their skin begins to curl or break away, you can add sea salt. Add a about 1.5 teaspoon at first then simmer and then taste the beans again and adding as much more salt as you desire -- just be careful because it's easier to add than it is to take away saltiness! When salting the beans you can add more water and simmer for another 20 minutes, taste again and repeat if necessary. Don't worry if there's "too much" broth as you can use it for reheating the beans and for making refried beans. Store leftovers, once cooled, in the refrigerator for up to 4 days or you can freeze for several months if desired, they freeze quite well. • Cooking time can depend on the quality of beans, drier ones will require longer simmering. Make sure to keep adding water so the pot does not dry out. If using black beans cooking time will be considerably longer. • Store the beans (once cooled) in the refrigerator in an airtight container. They will keep for about 1 week. Alternately you can also freeze them in ziplock bags for up to several months -- they freeze quite well. Now that you’ve made a pot of Mexican beans you can use them in any of your favourite Mexican recipes or turn the pot into a beans stew. The beans you’ve just made can be served as is with some warm corn tortillas on the side for a hearty beans soup meal. Alternatively they can be mashed up to make frijoles refritos or refried beans. I had always liked beans, but never really learned to truly appreciate them until I moved to Mexico. This was a love post–I like to think of it as a tribute to a favorite ingredient. And thanks for your kind words, Nancy. It was my husband who was having some worrisome health issues. why only 2 stars Friddam? I haven’t tried recipe yet, so I gave 4 stars for all the helpful and detailed info. I’ve been throwing my own version together for a few years now. But it doesn’t taste like the frijoles I love from Mexican restaurants. I use chili powder, not chilis. Does this compromise the taste? I also don’t use salt. I will add my sea salt to the end of cooking time. I have a pot simmering on the stove as I write this. I just came across your site today when looking up frijoles recipes. I will search for more recipes from you. Thanks for the time, love and effort you put into your work. I am a pre-soaker if I have time. The pressure cooker–I am a great proponent for cooking beans. Pressure cooking uses less propane/gas and if you let the pressure natural release (not running water over but just letting time do the release), the skins stay on and the texture is the same as a well-cooked batch of beans. Great post. Y epazote! I wish I wasn’t afraid of the pressure cooker, I really need to get over it. Thank you for the comment and tips! I couldn’t agree more Kiran, thanks! This makes me think I should be cooking more with beans… Delicious looking stew! G’day! Very interesting and informative blog post today Nancy, true! I always love your photos too! We love frijoles and these look specially tasty. Glad to hear it and thanks Daniela! I use beans also lately, we have such a cold winter this year. I cook lots and lots of comforting food-)) We need spring! Dear Nancy, thank you for a very interesting post and greet ideas. I honestly feel terrible for anyone who has not cooked beans from dried before–I used to think I couldn’t eat beans/didn’t like them when all I had was from cans (unpleasant stomach side effects, bland pasty textures, etc.). Since I’ve been cooking them from scratch, it’s a whole new world! I have trouble finding epazote, so I sometimes will throw in a small square of kombu seaweed (primarily used for making miso soup), which does the same thing for promoting good digestion. It doesn’t flavor the beans whatsoever. And of course the Indian method is fenugreek and turmeric, but those are fairly strong flavors. I’m not a fan of canned beans either, Fawn. Glad you were able to start enjoying “real” beans and the epazote too — love your substitute,thanks for sharing that tip. Enjoy your legumes! Thank you for the great tips. I felt like reading a well written text book. Also amazing is your photos – stunning! I now know I’ve been cooking my beans in the wrong way 🙁 I hope I’ll find epazote. Would love to try the culantro too! It’s okay, now you can start over the right way Daniela. Thank you and good luck finding both the epazote and culantro. This is exactly how I like my pinto beans cooked! Pretty much the same ingredients, but different peppers. Your pot of bean look awesome! I want to scoop some out and wrap them up in a tortilla. So good! Like you mother, I use my pressure cooker. I did watch rice spew out the pressure valve once all over the ceiling, but at least it didn’t explode. Ouch! Really, that’s great MJ. Ouch indeed but glad it didn’t explode. Thanks! Want! Nothing like a big pot of delicious, slow-cooked beans to use throughout the week. Thanks for all of your tips. Pinto beans were a staple in our house when I was growing up. My parents were from Louisiana and Creoles love red beans and pinto beans. My mother always soaked her pinto beans and black eyed peas. After reading this post I will no longer soak mine. I was a young adult before I had refried beans and it was love at first bite. I am so happy to have found your site. Have you ever made these beans in a slow cooker? I am going to a slow cooker (crock pot) party this weekend and want to make these beans. Also, do you ever use dried chiles like adobo or chipotle or chipotle in adobo? Thank you. No, I have never made them in a slow cooker — though I’d love to give it a try sometime. If you read through the comments you’ll see that many people do use a crockpot with great results. OK, “Spicy Foodie” AKA Nancy, I’ve been fighting the Epazote issue for a very long time with NO joy. Now I see that dried, broken leaves are available from “The Spice House” over the internet. If I must use those broken leaves, how much would I use to replace 2 or 3 fresh leaves? I Love Mexican food and fix it frequently. I am a bean lover since 1984, minnesota, usa, vegetarian. The information here is superb. I eat beans every day, and this site has given me much to enjoy for taste and health. Jalapeños can be spicy if you’re not used to the heat. Since this is your first time I would suggest perhaps omit the chili altogether. Or you could remove all of the seeds and pith and use only a small piece to give the beans flavour but with only a little bit of heat. Another option would be to use poblano peppers (also without the seeds) or a non-spicy bell pepper. i’m an old Southern farm girl; we grew all different sorts of beans, dried our own & cooked them. Loved this article. Right now have a crock pot of beans cooking. Would have beans almost every day but my husband disagrees. Thanks for the info. I love this recipe. Officially bookmarked. The only thing I did different was use bacon grease instead of olive oil. Thank you Amber, glad to hear it — and bacon grease is a great way to add more flavour to the beans! I made this recipe last weekend. I’ve always made refried beans with canned beans, but now that I’ve decided to take the plunge and use dried beans, I will never use canned beans again. These were so delicious! I followed the recipe exactly, except for the epazote because I couldn’t find any. My husband walked into the house while they were cooking and asked what I was making because it smelled fantastic. I’m making a double batch tonight because I am hooked on them. Happy to have found your recipe, I will make it today.. Thank you..
HI, Nancy. Thanks for this recipe! I picked up some mayocoba beans today at Aldi out of curiosity and found you while poking around for a way to use them. Like you, I prefer to make my own lunches as a more healthful and economical alternative to eating out during the week. I also happen to have some epazote on hand, from Penzeys, so I should be all set for the ingredients. A note on beans and gas – it’s actually the complex carbohydrates in the beans that cause gas in some people. Not everyone’s body produces the enzyme (a biological catalyst) needed to break down the complex carbs on their way down the GI tract. If they arrive intact at the end of the road, the microbes that live there happily eat them, creating the gas. Epazote supplies the enzyme, as do those little pills you can buy. Baking soda works as an addition to pe-soak water, as it also will break down the complex carb. However, you have to pour off the water and rinse the beans, as the sodium content of the baking soda will interfere with the cooking process, slowing it, and result in a less-than-satisfactory dish. I’ve made a lot of homemade beans with a variety of different techniques and this is definitely my favorite! It’s easy, you can remove the onions after they’re done cooking (I don’t like chopped onions in my beans), and the beans turn out super flavorful. Thanks for this great recipe! I spent time in Mexico and with family here. We often made frijoles de olla . We never soaked the beans and the only thing we added was salt . Then we would eat it as a soup by adding sour cream and onions. Delicious! then we would make the rest refried.